Inspired by diversity, democracy and the pulsating demographic that makes New York City great, the WE chair is a celebration of the people. Whether occupied or empty, these denizens of the Battery Green make a statement 24/7. Residents and tourists alike can ‘mingle with the crowd’ stirring up a sense of companionship and camaraderie. WE can be you and your chair, you and your chair and the chair next to you, you and your chair and someone else and their chair, all the chairs and all their occupants and so on…. 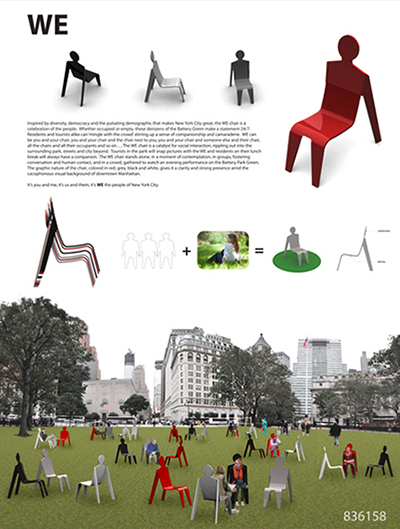 The WE chair is a catalyst for social interaction, rippling out into the surrounding park, streets and city beyond. Tourists in the park will snap pictures with the WE and residents on their lunch break will always have a companion. The WE chair stands alone, in a moment of contemplation, in groups, fostering conversation and human contact, and in a crowd, gathered to watch an evening performance on the Battery Park Green. The graphic nature of the chair, colored in red, grey, black and white, give it a clarity and strong presence amid the cacophonous visual background of downtown Manhattan. It’s you and me, it’s us and them, it’s WE the people of New York City. The WE chair is constructed of molded polypropylene - chosen for its durability, sustainability and integral color - over an inner frame of recycled aluminum. Polypropylene is one of the most sustainable materials used in furniture fabrication today, created from the gaseous waste generated by oil production - gases that would otherwise be released into the environment as air pollution. Water used during the manufacturing process is contained in a closed cooling cycle that avoids any contamination of ground water, lakes or streams. Polypropylene is also 100% recyclable, meaning it can be melted down countless times and reused in a variety of manufactured products without degradation. In addition, because of its superior durability, polypropylene furniture can last a very long time and therefore be replaced far less frequently than products made from metal or wood. 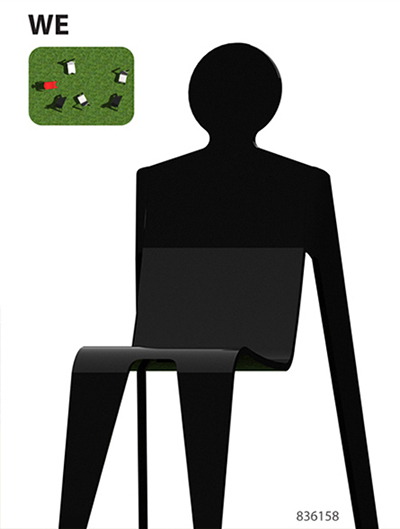 A functional prototype of the WE chair could easily be constructed from molded plywood prior to final fabrication in order to tweak the design dimensionally and to insure maximum comfort.